Silk lace dress with boxer shorts underneath by Poole at Shape. Shoes by Biba. Choker and fake violets from John Lewis. Rich renaissance colours in velvet, lace and crepe reflect the mood for Christmas. Emphasis is on the shape of the body – necklines plunge, backs are bared, and skirts are slit in a demure, but wanton, fashion. Crepe dress in black, mauve and green by Alistair Cowin. Shoes from Biba. Plum silk lace wrap over blouse with matching waist ties by Poole at Shape. Gored skirt in deep green velvet by Foale and Tuffin. Shoes from Biba. 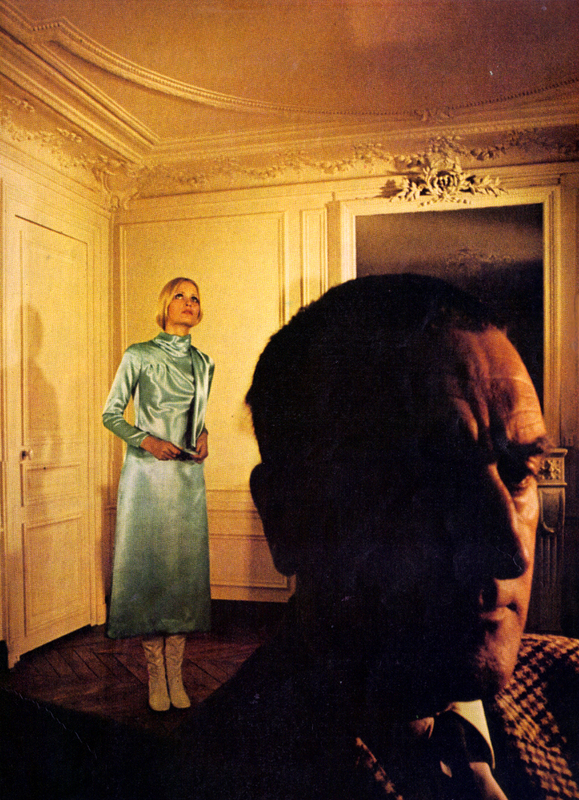 Charcoal green dress and crepe shoes all from Biba. Velvet cap from Feathers. Veiling from John Lewis. Crepe dress by Stirling Cooper. Shoes from Elliott. Lilac velvet cap from Feathers. Blue Tricel wrap over top and flared skirt both by Poole at Shape. Shoes from Biba. Brown, beige and rust panne velvet dress by Gillian Richard. Black shoes by Elliott. 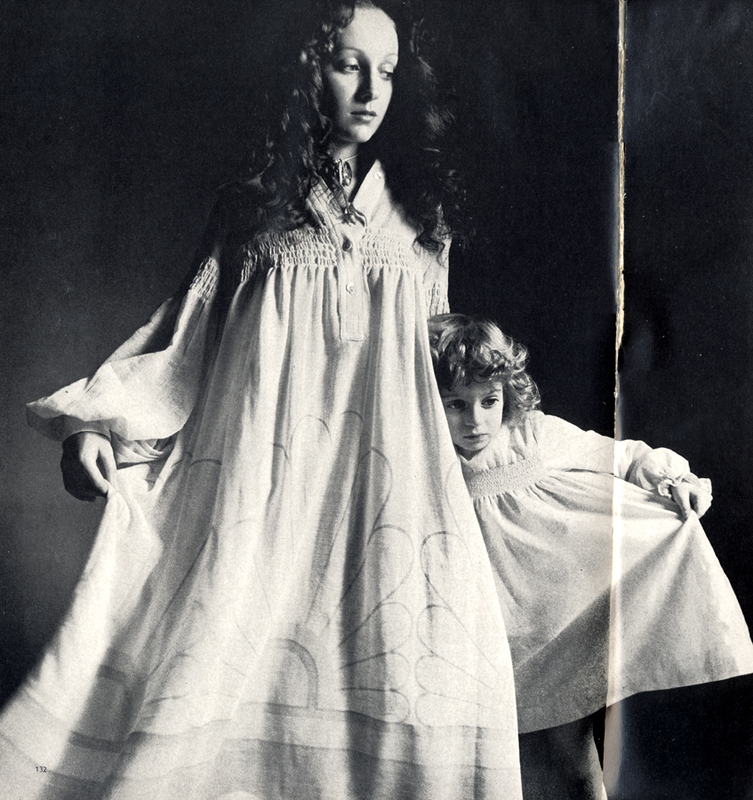 Smock by Leslie Poole for Annacat. Small smock from Little Things. 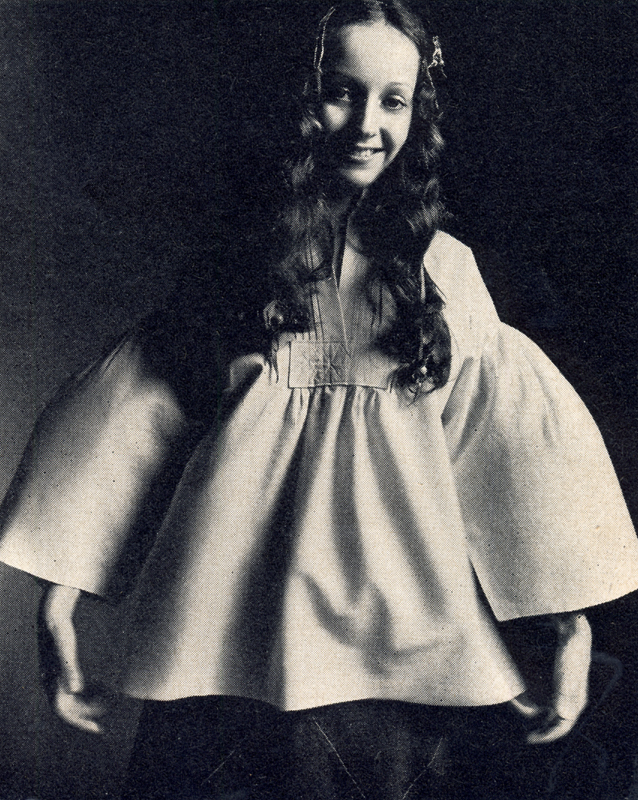 Smock by Mary Quant Ginger Group. Velvet Holbein hat from The Sweet Shop. Smock by Lati Ptochis at Boston-151. Flower trailer by Pablo & Delia. 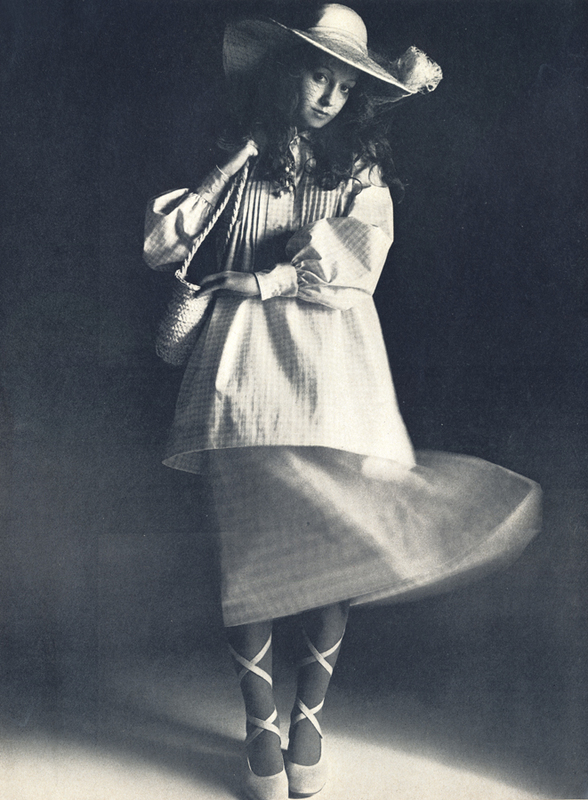 Smock and skirt by Tony Berkeley. Shoes by Pedro Garcia. Wristlet by Pablo & Delia. Hat by Malcolm Raines at The Sweet Shop. Smock by Janice Wainwright at Simon Massey. Painted hair decoration by Pablo & Delia. 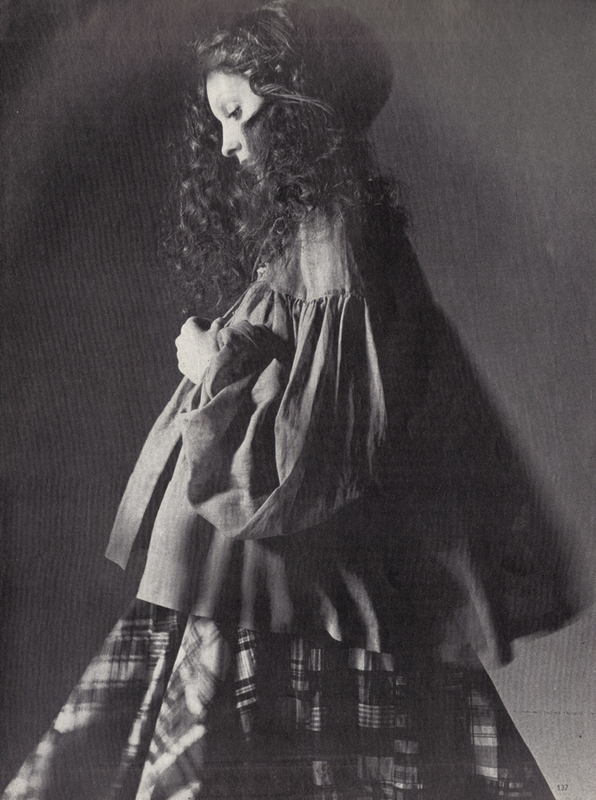 Smock by Margit Brandt, skirt by Kumari, both for Scorpio. Bird’s egg blue and white spotted shirt and striped trousers at Pierre Elegante. Hat by Edward Mann. 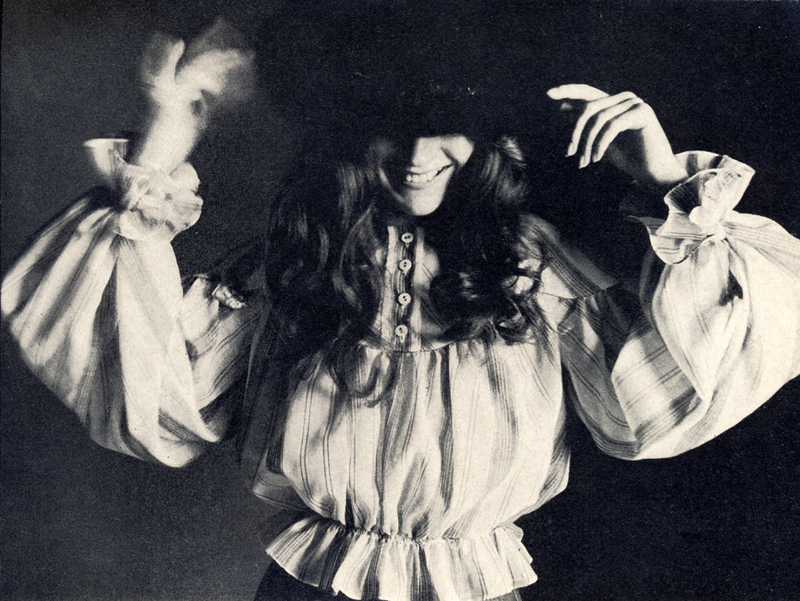 Photographed by Elisabeth Novick, from Vogue, April 1973. If I could spend most of my springtime dressed like this, I would be happy. Sadly, I am currently living in thick black tights and long sleeves while the entire country shivers its way into May. Dungarees by Leslie Poole at Annacat. Hat from Liberty. 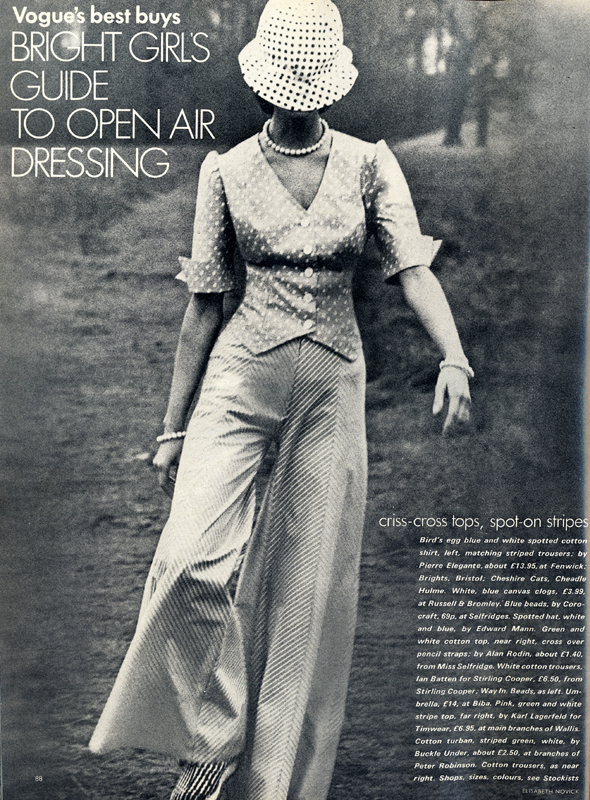 Left: Top by Alan Rodin, trousers by Ian Batten for Stirling Cooper. 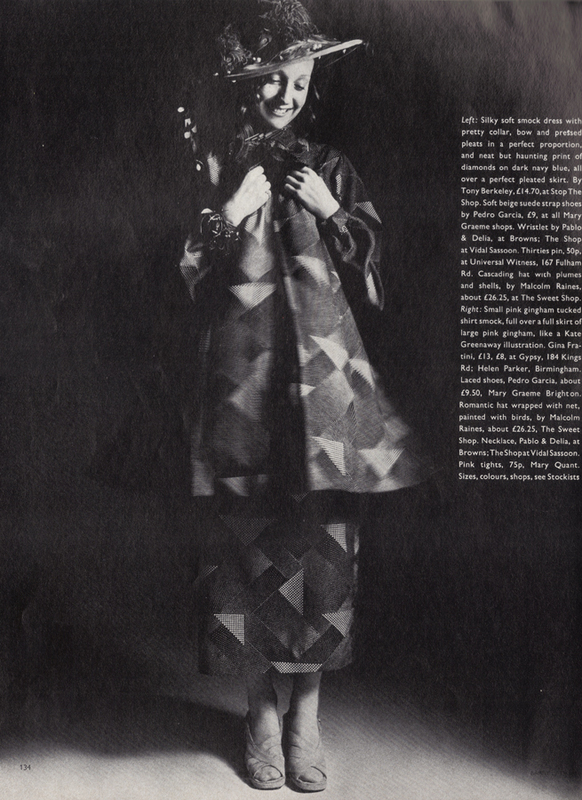 Umbrella from Biba — Right: Top by Karl Lagerfeld for Timwear, trousers same as left. Turban from Buckle Under.